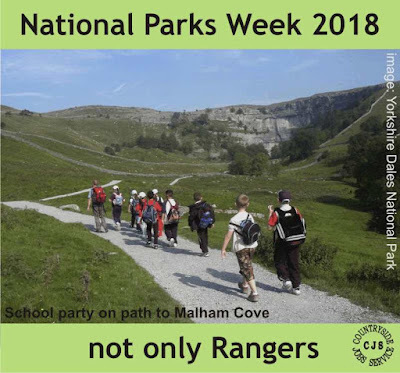 National Parks are more than land managers, although the ranger service is usually the front line, and do so much more than countryside management alone. Being covered by different levels of protected landscape designations wildlife within the parks can be varied and often of high conservation value, for example some iconic species in the Yorkshire Dales would include Black Grouse, Red Squirrel, Peregrine Falcon, White Clawed Crayfish and the Northern Brown Argus butterfly. Looking after these species, and many more, falls under the care of Wildlife Conservation Officers, read the inside story of wildlife conservation work in the Yorkshire Dales National Park in this article written for CJS Focus on Wildlife. Getting people walking (and riding) safely around the Park falls to the rights of Way Team and sometimes the field staff to repair and manage damaged paths and bridleways, here in the North York Moors we have an unusual situation with one of our best known and loved walks is the Lyke Wake Walk which was devised by local farmer, mountaineer and journalist Bill Cowley in 1955 and quickly became a test of stamina for walkers to complete the route within 24 hours. In 1955, 191 people completed the walk; by the 1970s, 15,000 people were walking the route each year. Managing this amount of foot traffic would be difficult enough but it is compounded in that part of the Walk is not actually an 'official' right of way for part of the route creating particularly difficult conditions to manage, find out the Authority tackle this knotty problem in their article Managing the Lyke Wake Walk. The Second purpose of the Parks creates another set of problems to tackle and visitor management is at the forefront of these, the Yorkshire Dales says: "A balance has to be struck between the economic benefits of the visitors and the cost to the local area and, whatever the weighting of that balance, it will never please everyone. But the most import factor that overrides everything else is that the future protection of this precious and fragile landscape must take priority." Find out how they manage this delicate balance in their casestudy of visitor management in Malham here. Introducing the magnificence of the Parks, the wonder of the wildlife and the importance of looking after our lovely landscapes falls to the Education team and nowhere is it more important than in the Environmental Education programmes aimed primarily at school children, Exmoor National Park has one of the longest running such programmes, read about it here. Together all these different departments work together to ensure our National Parks remain our most cherish landscapes and are fit for the future. Their roles are currently being evaluated in the Government's National Parks Review (more here).